Your aircraft gently banks over the expansive Strzelecki desert. In the shimmering distance is Birdsville. 1000 feet below, the Diamantina River winds its way sedately southwest. Pelicans paddle in the warm Queensland floodwaters, hawks and egrets circle on thermals above clay coloured waterholes, searching for food and sharing a bird’s eye view of the vast outback. Thirsty trees hug riverbanks. This flight is over the incredible Goyder Lagoon, just south of Birdsville. A massive wetland of fibrous channels and lagoons all rich with wildlife. It’s one of the outback’s unexpected hidden gems, only really appreciated from the air. The lagoon empties into the Warburton Creek and then onwards to the enormity of Lake Eyre. The elongated cinnamon coloured dunes of the Simpson Desert disappear northward, the russet gibber plains of the Strzelecki Desert stretch southward into the distance. Ahead is the crystalized surface of Lake Eyre. Glacial white and crusty with salt. Soft blues and sometimes pink with beta carotene pigment where the water lays . Exquisite pastel browns of every shade on a slowly baking surface. 140 kms long - the awe-inspiring Lake Eyre leaves passengers in a state of quiet reverie. On a 3-day trip with A Kube Aviation you will see some of Australia’s most iconic locations. Lake Eyre/Kati Thanda and Birdsville, Innamincka and the Dig Tree. The Flinders Ranges, the Murray River and the Big Desert & Sunset Country. You might prefer a day trip over the Coorong in SA or a short flight around the Wimmera taking in the Grampians and the many lakes and farm land. Anything is possible. From the window of your private high winged Cessna you will marvel at exquisite views and savour your personalised unique adventure. Flights with A Kube Aviation depart from Horsham or Nhill, giving you the opportunity to breathe in the beauty this country has to offer from your doorstep, you’ll even be home in time for dinner! Located just 10km from the township of Nhill, Nhillbilly Farm is a B&B farmstay like no other. Hosts Sharon and Lofty offer a unique experience with glamping style accommodation and wholesome dining, all within the serene setting of their beautiful farm. 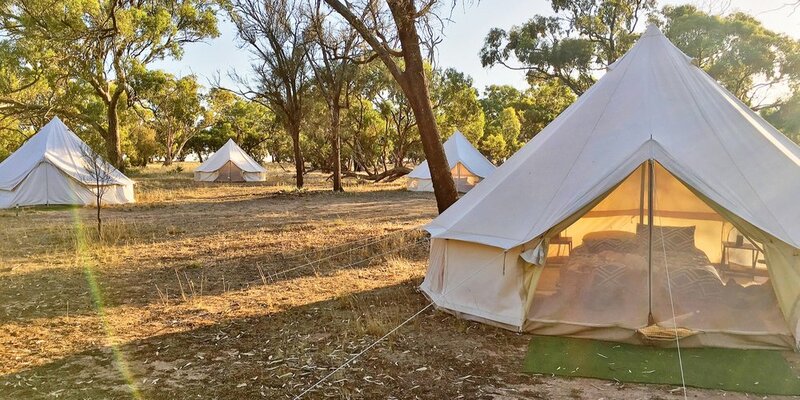 Nhillbilly Farm is set upon 100 acres of trees, birdlife and dams, providing a serene and secluded setting, surrounded by many of the natural attractions the Wimmera has to offer. The farm, located on Uthmeyers Road, was bought from the Uthmeyer family and has since been home to Sharon Maloney and Lofty Turgoose. The couple originally transformed their space into a place for family and friends to stay when they had their wedding on the property. The weekendlong event was such a success and left their guests gushing with excitement, so much so that Sharon and Lofty decided that others might also like to discover and experience the hidden gem they call home. From the moment of arrival at Nhillbilly Farm, Sharon is a warm and welcoming host and has a real passion for providing guests with a memorable experience. A city-dweller most of her life, Sharon uses her own perspective to really highlight the simplicity and magic that makes rural life so special. The camping area of the farm includes ten glamping-style bell tents tucked away between the trees, with comfortable bedding and ample room to relax and enjoy. The fire pit and eating area sit upon the edge of the dam, which is perfect for a quick dip to cool off in the summer months and home to a few local yabbies, making for a tranquil and serene setting. Rustic and completely charming, the old horse stables of the farm are home to the bathing and toilet amenities and the open air showers and bathtub are truly a unique experience in themselves! Nhillbilly Farm has been a destination for many travellers up and down the Western Highway, with most guests stopping in for one or two nights and some staying up to a week. The farm has also hosted birthdays, hens parties, family gatherings and more, with Sharon and Lofty looking to develop the space even further. Located just 15km south-east of Halls Gap, James McMurtrie’s Glass Blowing Studio and Gallery is one of the hidden gems of the Wimmera, offering a rare opportunity to see glassblowing in action. Stunning, unique and Australian made, James’ work takes the form of lights, bowls, vases, garden sculptures, glass scapes and more. The artworks are inspired by the Grampians Mountains that surround the studio, its ever-changing landscape, colours and moods. James also takes inspiration from travelling and historic architecture, with a particular interest in work that utilises local materials in the building process. With 25 years of experience, an arts degree and a background of working with clay, James credits his interest and the enjoyment he gets from making things with his hands to his childhood growing up on a farm, and his mother’s passion for textiles. Combining these practical skills and artistic flare result in eye-catching work, which are not only found in the Pomonal studio but are showcased in galleries across Australia. The studio houses a furnace running at 1100 degrees, which molten glass is drawn from and incorporated with colour from New Zealand and Germany using tools similar to those used in 1st century BC. When pieces are finished they are placed in a kiln to take all the temperatures down slowly. James says he finds the firing process most fascinating and opening a kiln to look at the results of a days work is always an exciting moment. “Working with tools similar to that dating back to the first century B.C. fills me with a sense of history and tradition of the old techniques. Glass blowing proves to be an exciting medium with which I can experiment and express my ideas with immediate results on a daily basis” says James. The studio is open to the public to visit and the furnace runs 24 hours a day, 7 days a week for most months of the year. While the furnace is running, glassblowing demonstrations are available subject to work schedule, or you can organise an appointment. If you’re up early on a Saturday morning and venture down to the banks of the Wimmera River, you’ll see over 120 parkrunners: adults and children, runners and walkers, out and about, going through their strides. Parkrun organise free, weekly, 5km timed runs around the world, and we are lucky to host our own parkrun along the Wimmera River, kicking off at 8am each Saturday morning. The volunteer-lead events encourage walkers and runners of all abilities to come along and race against the clock. Each week over 120 participants come together and enjoy the scenic course along the river, starting at the Horsham War Memorial, crossing the river and looping back around. In addition to those participating, you’ll see a turn out of about 20 support crew, plus 7 or more volunteers who rotate weekly as it is just as fun to help as it is to join in. You don’t have to be a seasoned runner to tackle the course; Wimmera River parkrun sees many walkers, prams and of course kids. The only rule to keep in mind is that children under 11 need to be supervised at all times, and strictly no bikes or scooters. Dogs are welcome too, but must be on a short lead at all times and one dog per person. No one finishes last as there is always a volunteer tail walker. The events really are focused on encouraging a healthy community and a fun social outlet for everyone. The Wimmera River parkrun was launched in August 2018, lead by Candice Muszkieta and Andrew Sostheim, who applied for local grants to get the events up and running. “Both Andrew and I noticed there was something missing for those people who didn’t play sport i.e. netball, football, hockey etc. how can we get them to join in and be part of the community?” Said Candice. “What if they were new to the town, or injured and still wanted to socialise but weren’t ‘club’ affiliated? We thought parkrun would be a great fit for Horsham and so far we are more than happy with the local involvement and all the continuous new faces we see each week”. The parkrun team are planning various themed events throughout the year including a Christmas run. Plus, each week the parkrunners grab a post-run coffee; the venue is on a rotation basis and announced each week on Facebook and at the run briefing. 4. Meet at the Horsham War Memorial at 8am on a Saturday, and run like the wind! Horsham’s parkrun is a flat, out and back course along the banks of the Wimmera River. The course starts adjacent to the Horsham War Memorial before crossing the river using the Centenary Bridge. After the river crossing, turn left along the sealed path towards and under the Western Highway Bridge to the turn-around point. Then return to the start/finish area using the same paths. The track is a mixture of sealed surfaces. Almost halfway between Melbourne and Adelaide, Horsham is the perfect rest stop for those enduring the long trips up and down the highway. An oasis in the centre of town, May Park, has seen many a local and traveler enjoying a bite to eat and some shade on a hot summer’s day. May Park is conveniently located on the Western Highway and offers plenty of parking, takeaway food options, BBQ area, picnic tables, playground, shade areas, grassed sports area, accessible toilets and a service station close by, making it the ideal location to recharge the batteries. Plus, if dining in is more your style, the Horsham Sports and Community Club and Victoria Hotel on the Park are just a stone throw away. May Park hosts the Annual Car and Bike Show in March, and over the years has been home to many sports events, Carols by Candlelight and Art Is festival. The land that was to become known as May Park was owned by John Gillies when he sold it in 1864 to the Wimmera Shire Council for £77/15/0. It was originally a dam for drainage (including from the May and Millar foundry on the northern side of Victoria Parade - now Dimboola Road), then became a grazing ground for the cows belonging to the residents in the town, followed by a clay pit (used in the 1890s by a local potter George Abbott) before becoming the recreation and garden area we know today. May Park was transferred to the Borough from the Shire in 1932 and the land was gifted from the Shire to become council property in 1938. The Borough had paid for a bandstand (constructed in 1921 then repaired in 1923) which was sadly removed after World War II - its roofing was used on the city oval booth but that structure was demolished during the 1980s. During the years 1947 and 1948 May Park received renewed interest from both the Borough and the local progress association and so the Millar fountain, which had stood at the intersection of Firebrace and Wilson Streets since 19 February 1902, was moved to its current Park location to be re-roofed in later years. After being open to the public for some years in 1920 an ‘Official Opening Ceremony’ took place, and May Park was officially declared open by the Mayor of Horsham Cr J Bennett. In 1921 The Horsham Times reported on May Park Improvements - “A quarterly general meeting of the above association was held in the Town Hall on Thursday evening. Mr J A Morcom presiding over a fair attendance. The President reported that the gross receipts of the collections for the four band recitals held in May Park amounted to £45/14/6, and the expenses, includingadvertising, printing, posters, erection of band stand, etc would amount approximately to £10. A May and Millar wagon was restored and housed in May Park in February 2017. “Twenty six years after it was surveyed, Horsham was able to organise an Agricultural and Pastoral Society and have its first annual show in 1876. From the very beginning, the aim of the Horsham and Wimmera District Agricultural and Pastoral Society was to ‘improve the quality of livestock and to promote agriculture’ in the district and this the Society has endeavoured to achieve throughout its first hundred years of existence.” (Exceprt from ‘A History of the Horsham Agricultural Society 1976’ by the late Ian Maroske). So here we are in 2016, a community celebrating 140 years of the history of the Horsham Agricultural Society as it is now known. In two years time celebrations will be held for the 140th Horsham Show due to their being no shows held during World War II, in 1941 and 1942. As tradition continues, the Society is currently lead by the youngest ever President, 23 year old Dalton Cross who has a strong commitment to the Horsham Show and to the Society where the team of young members continues to grow. Dalton cordially invites former and current Society members, show sponsors, patrons and the communnity to this free gathering, which will be held on the banks of the Wimmera River at the Showgrounds on February 17 from 5.30pm. Guests are encouraged to ‘come as you are’, straight from work to share a drink and some stories at the bar with the current members of the Horsham Agricultural Society. Pizza’s will be on the menu and live music will be provided for everyone’s enjoyment. The celebration of this anniversary has been delayed to fit in with the 2016 harvest, enabling farmers and many in the agricultural industry to attend. For more information please call 0400 425 254. This event has been supported through Horsham Rural City Council’s ‘Connected Communities Small Grant Initiative’ provided through the Local Government Drought Response Package - Regional Development Victoria. The official launch on 14 November at Deirdre’s Laharum Grove, of a unique illustrated map and guide to Wartook Valley was the culmination of a year’s work for Melbourne artist Jenny Bowman. This beautiful and educational artist’s interpretation of the Valley was made possible through the work of volunteer members of the Wartook Promotions Group, Victoria State Government Bushfire Fund and the support of Grampians Tourism and Horsham Rural City Council. It is hoped that the map will foster a sense of place and pride for local residents (especially after the fires and floods of recent years) and to promote the region, increasing tourist visitation and raising awarenessof the beautiful Wartook Valley and the wider region. The map is designed in the tradition of those lovely old illustrated maps that we may have collected on our travels and brought back home because they were too beautiful to throw away. We now have a guide to what the Wartook Valley and Grampians region has to offer that we can proudly make available to both national and international travelers alike. The front of the map gives a strong sense of the entire Wartook Valley and the reverse side of the map provides suggested itineraries, background information, accommodation, dining and attractions within the Valley and surrounding area. The map is also available in poster size. Perhaps it will be tacked onto a wall in Holland or Germany to remind the travelers who bought it, of a wonderful few days in a very beautiful part of Victoria. The artist and designer, Jenny Bowman has endeared herself to locals and has travelled to the Valley twice on research trips, visiting areas of interest, doing drawings, taking photos and staying with Wartook Valley residents. Jenny is a Melbourne artist and teacher who worked at The Age newspaper for many years. As a freelancer, her clients have included Penguin and Lonely Planet. She has created many illustrated maps for various publications Her published work includes Winery Regions of Victoria and the Yarra River. Most of her maps are drawn using a dip pen, ink and water colour. She also makes digital maps using Illustrator and Photoshop. Jenny loves exploring towns and regions in Australia, photographing and illustrating them. Like many Australians she loves to travel overseas, but wishes more of us would spend time exploring our own country. There is so much diversity to experience, and we can help keep our rural areas alive. On Tuesday 15 November, the day after the launch, the artist gave a talk to students at Laharum Primary School explaining her working process to create the map and the Wartook Promotions Group gave a map to each student. Maps and posters are available at Visitor Information Centres in the region. The tumultuous journey of the much beloved ‘Red Cherry Food Bar’ has now found a sure footing with new local owners Lyn Rogers and Les Harding, coming in to reopen and revamp the café into the new and improved ‘Café Red Cherry’. Bringing experience and the desire to bring the café back to its former glory, Lyn and Les seized the opportunity to put their twist on it, bringing their 15 years of food service experience and embracing the 1960’s retro diner style which is evident before you even walk in the door. Red and white diner styled seating, records and vinyls of an era past and an atmosphere that sends you back in time to when ice cream floats and slicked back hair were the norm. An older generation will fondly remember times past and the younger kids of today will get a taste of what the 60s were like in Café Red Cherry, being enjoyed by all. Not only does Café Red Cherry sends us on a time warp, they also provide some of Horsham’s tastiest home cooked foods, including florry sandwiches, delicious hamburgers and bain marie food ready to be enjoyed at smoko. With Summer underway, Café Red Cherry also boasts a large selection of cold drinks and ice creams to cool you down. Scrumptious slices are always a hit for everyone, and the Café Red Cherry offers a wide selection for you to peruse and feast on, all while enjoying their praised Caffé Firenze, fillipo coffee which has been described as a light, medium finish coffee with a sweeter and more delicate mouth feel. If your feeling more peckish and in need of a meal, then the Café Red Cherry can accomodate you with their all-day breakfasts, lunch meals and a plethora of snacks to keep you satisfied, yet still wanting more. Catering is available too for your function or event, and the Café can be even booked for after hours for private functions. Come into Café Red Cherry, get your coffee card and meet the happy and friendly staff just waiting to introduce themselves to you. Turn the jukebox up, order a coffee and bask in the new and improved Café Red Cherry, open 6 days a week from 8am, situated next to the Westpac Bank in Firebrace St, Horsham.